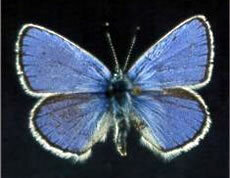 The lotis blue butterfly is believed to be extinct and has not been seen in the wild since 1994. Conservationists believe that if they still exist they may be found in only a few remote areas of Mendocina on the northern coast of California. This butterfly is small with a wingspan of about one inch. Males are more brightly colored than females; their upper wings are deep violet-blue in color with a black border and fringe of white scales along the outer wing margin. Females are brown or sometimes bluish-brown, with a wavy band of orange near the outer wing margins. Both male and females have grayish-white undersides scattered with black spots. The preferred habitat of this species is wet meadows and sphagnum willow bogs where as caterpillars, it is believed that they feed on the seaside bird's-foot trefoil (Lotus formosissimus), a common plant found on the Mendocino coast in damp coastal prairies. Like most butterflies, the caterpillars depend on their host plant to survive. Females lay their eggs on these plants, so that their young can feed on them in order to grow. The exact cause of the decline of this species is not known. Some conservationists believe that this species has suffered from habitat disturbance by humans and natural drought. Its bog habitat is known to undergo a natural process of dry seasons, but human activities may have prevented the formation of new bogs in the past. 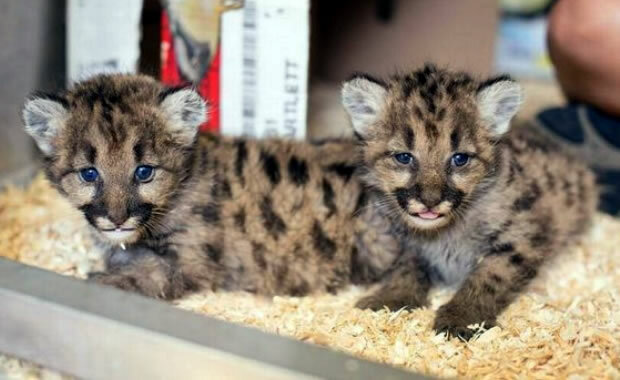 Conservation plans for this species include a captive breeding program that would be initiated immediately following the rediscovery of live specimens. Glenn, C. R. 2006. "Earth's Endangered Creatures - Lotis Blue Butterfly Facts" (Online). Accessed 4/24/2019 at http://earthsendangered.com/profile.asp?sp=565&ID=9. Need more Lotis Blue Butterfly facts?